Italy becomes more and more popular placer for visiting every year. It is said that two of many reasons to visit Italy are its rich history and aromatic coffee. There is no time to prove or deny. It is better to speak about the best cafeterias in Italy that are considered to be historical city sights and interesting places. These eating establishments are not only the eating and interior standards but the witness of important political events for many years. You can feel the past events by drinking the cup of aromatic cappuccino or espresso. It was appeared in 1720. Meet the ancient and very old cafe in Italy – Florian. It speaks about the glorious past of Venice that happened many years ago. The honorable visitors of this unique cafe were Byron, Goethe, Russo, Guiseppe Parini and Foscolo. The great and popular Casanova captured the ladies’ hearts right there. Later, in 1848, the cafeteria was the command center of revolutionists, where people claimed to free Niccolo Tommaseo, Daniele Manin. The first name of this cafe was Cafe alla Venezia Trionfante and Cafe Florian later, after the founder’s name – Floriano Francesconi. The walls, furniture and atmosphere keep Italian charm and contribution. It was firstly appeared in 1860. Gran Caffè Gambrinus has always been the literary cafeteria with interesting interior in Belle Epoque period. It was always the right place for intellectual and political meetings and discussions. Gabriele D’Annunzio was writing the text to his popular song Vucchella. Benedetto Croce was the follower of the Hegelian school of philosophy. He assigned his interviews, political, business and friendly meetings right here. It was created in 1733. The Jilly’s family from Switzerland was founded the bakery Bottega dei Pani Dolci in 1733. It was always the best-visiting place for rich natives. Later, prominent artists, journalists assigned their gatherings there. As a matter of fact, it was the right place for young Florentines, tourists and other people, who discovered this place to drink coffee and speak about arts. It was appeared in 1891. This cafe is located close to Piazza Navona. It consists of three cute little areas decorated in different architecture styles: baroque, modern and empire style. You can visit this place any time for coffee. There is a picturesque terrace with the view to the big city square and grateful cathedral. A lot of prominent and beginners in art, pains writing gathered together in the cafe. By the way, such popular artistic flow as transavangarde was created right here in the walls of Antico Caffè. It was built in 1780. Caffè Fiorio was created in 1780. The cafe was renewed in 1845 to be one of many establishments that still look like in the ancient times: lamps, mirrors, velvet lining and textile. The cafe is also popular of its tasty ice-cream and coffee. Fiorio was attractive place to take some coffee for Camillo Benso conte di Cavour and many politicians, such as Rattazzi and Massimo d’Azeglio. It is also said that Carlo Alberto di Savoia, the king Sardinia, was interested in Fiorio as it was the splace for affluent celebrities. It started work in 1867. 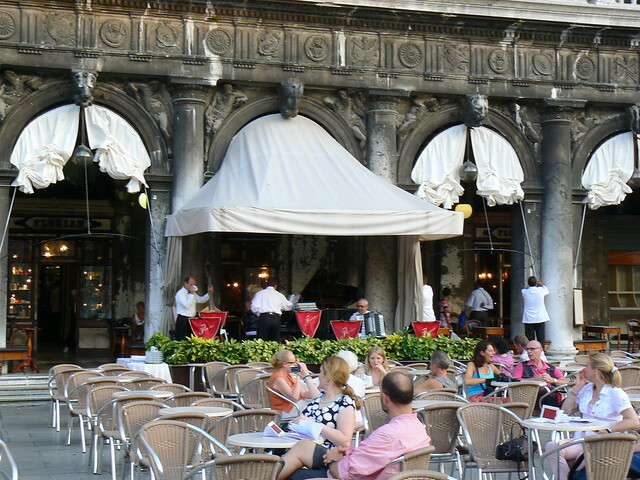 The cafe Zucca is glorious place, as old as the glorious Milanese passage Vittorio Emanuele is. All great Italians, Giuseppe Verdi, Puccini, Arturo Toscanini and Giuseppe Giacosa visited this place for some coffee and chatting. Look at this interior: ancient lamps, mosaics, massive mirrors. It looks like the cafe from 60th. It was appeared in 1476. It is impossible, but fact: Caffe del Tasso was appeared in the 15th century. The cafe got its first name – Locanda delle due Spade in the Revival age. Nevertheless, it was renamed as Tasso in honor to the popular poet Tasso in1681. The charming cafe is located in the square of Vecchia that is the best admirable place in Bergamo. So, Tasso was a place to speak to musicians, interesting painters, original writers and other artistic people from Bergamo. 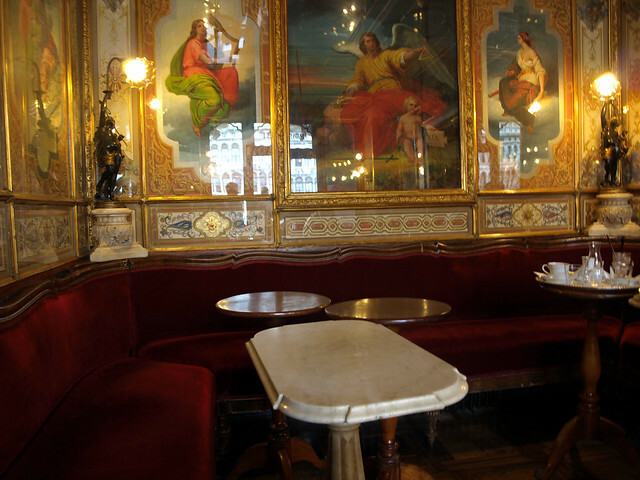 The cafe was renewed in the style of neo classicism in the 19th century to get the name Caffè del Tasso. It started work in 1842. This cafe is really impressive place for coffee in the city. It is masterfully combined of many different facades, mixed together. The cafe was created in 1831 by Francesco Pedroche. The cafe building was creatively restored and renewed many times by his famous son Antonio. It was the heart of the city, its cultural, political, artistic and historical center. It was also the shelter for students and revolutionaries. The familiars and guests of Pedrocchi were Stendhal, Byron. This is still the center of cultural life in Padua. Come and see. Catania is a city in Sicily that is full of interesting restaurants. Of course, it is not Milano or Bergamo, but Catania gives a chance to drink wine or coffee underground on the bank of the river. How is it possible? It is said about the Amenano River – the underground water in Catania that gives water for the popular Fontana dell’Amenano. Nevertheless, there is always a sense to see this river in its natural position – underground, drinking wine in the cozy cafe. By the way, it is not far from the Duomo. Tuesday offers big sales for drinks and snacks. You can hire a car in Catania and go to find one more cafe for dessert. The best ice cream shop in Catania is Gelateria Quaranta that is situated in the square of Vincenzo Bellini. The best confectionery shop where you can try cannoli and chocolate desserts is C&G in Abramo Lincoln. The prices are adequate: you pay 1-2 EUR for cappuccino and 2-3 EUR for your cake. Speaking about tips, the tips are included in your bill. So, there is no tradition to leave tips. The service is good and atmosphere is friendly. You know, whenever you go in Italy, you are always welcome visitor and guest. This entry was posted in Travel and tagged Catania, Italy, sicily, travel. Bookmark the permalink.